A rendering of a self-storage building planned for Powerline Road and Broward Boulevard in Broward County. Developers are trying to improve the design of these facilities. Self-storage facilities may be mundane industrial buildings, but they’re eye-catching profit centers for South Florida investors and developers. Market observers say supply is nowhere near demand as the tri-county region becomes increasingly urban with downtown renters and condo owners in need of more room to stash their belongings. The Colliers International commercial real estate firm tracks 220 self-storage facilities in Palm Beach, Broward and Miami-Dade counties. Colliers said a dozen were built and opened in 2016 and 15 to 20 are being built every 16 to 18 months. Though increasing competition will mean some buildings get built in questionable locations, investors generally flock to the self-storage sector because stable occupancy generates steady returns — typically 8 to 10 percent, Massirman said. A new self-storage facility in Plantation is expected to open in the first quarter of 2018. Tom Speno Jr., a director at Preferred Realty & Development in Margate, said South Floridians are squeezing into smaller spaces, but a lack of self-storage construction during the Great Recession created a shortage of options. Preferred is seeking a building permit from the city of Plantation for a 101,533-square-foot, climate-controlled building on Sunrise Boulevard, just east of Florida’s Turnpike and across from the Strada at Plantation townhomes. The company expects to start construction in April and complete it in the first quarter of 2018. Preferred’s three-story project will give all customers inside access to their units, Speno said. And the building façade will have brick and glass — more appealing than older, single-story drive-up facilities, he said. “From the roadside, it looks like a hotel or an office building,” Speno said. Massirman said cities across the region are insisting that developers improve the designs of self-storage buildings. The firm has 12 projects completed or in the pipeline. On some of the buildings, colored boxes are incorporated into the façade. The buildings are three, five or eight stories; the lobbies are clean and well-lit. “You can’t make a 100,000-square-foot box disappear, but you can complement the fabric of where it is,” Massirman said. Self-storage development traditionally has been relegated to dingy warehouse districts, but the new breed of building is on main thoroughfares close to where customers live. Michael Kaufman, CEO of Kaufman Lynn Construction in Boca Raton, said new self-storage facilities are designed with ample room inside to give clients enough space to move heavy furniture and other bulky items. Some of the buildings even have music playing in the hallways. “People actually enjoy being there and feeling comfortable in that kind of environment,” Kaufman said. Kaufman Lynn recently broke ground on a 132,000-square-foot facility along Congress Avenue in Delray Beach. It’s part of a mixed-use project that also will include a Class A office building serving as Kaufman Lynn’s 135-employee headquarters. The opening is scheduled for the end of 2017. 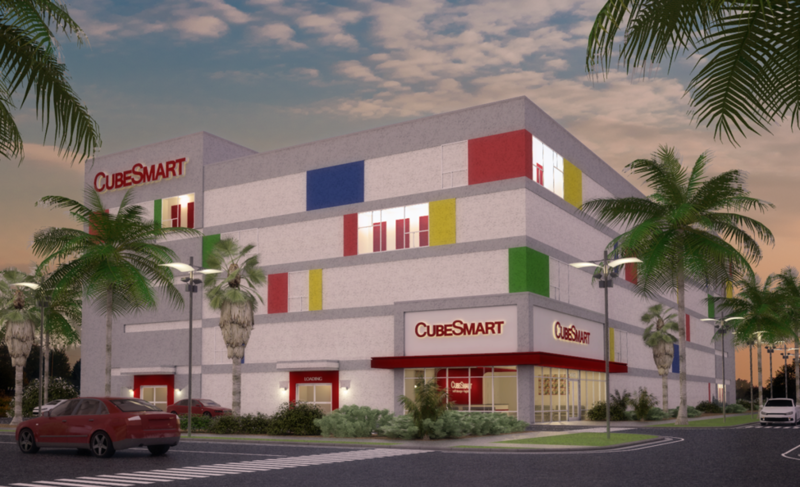 It’s not every day that city officials are asked to approve a new corporate headquarters paired with a self-storage facility, Delray Beach Mayor Cary Glickstein said. Still, the city was impressed by the sleek design and confident that Kaufman Lynn has a vested interest in maintaining the development.